Five more teams crossed the Sesquicentennial Mark again in May, with the top score of the Month belonging to the Unusual Suspects! The Suspects not only gained a new personal best, and the highest score of May 2017, but after gaining the highest score for a runner-up in April... they're the top team at Cardinal Rule and all of Trivia Club! Just two points behind them, with the highest score at Hitch for May, is Like A Muffin Or A Beet! This new take on that familiar Matt & Pat style (who appeared FOUR times on the Top Ten of April) was an exceptional "debut"! Four of the Top Ten high scores of May took place on the last day of the month, with newcomers Team Hustle Harder gaining the highest score for a runner-up! The M. Night Shaym-Aliens not only have the highest score for a third place finishing team, but as the only team to appear twice on the Top Ten for May, that score is also two and a half points higher then their Golden VHS winning score the week before! Three other scores belong to the Monday, of the same week of the May 31st Trivia Club event, making the final week of May a wildly competitive capper to the month. The eleventh highest score of the month belongs to Last Place Team for the second month in a row, with their 93 points on, you guessed it, May 31st! After seven consecutive months the Cunning Stunts did not make an appearance on the Monthly Scoreboard (aided very much by the fact that they have not competed since the GCGP Finale)! This is the third consecutive Scoreboard to feature a high score from Wookiee of the Year, and adding to that... each of those high scores came in a losing effort! 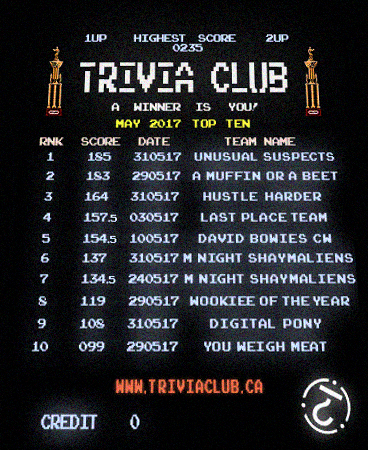 The Mean Team for May, the high score closest to the scoreboard average, are the M. Night Shaym-Aliens.